Wed, Jan 16, 2019, 11:28 am SL Time, ColomboPage News Desk, Sri Lanka. Jan 16, Colombo: The Ministry of Health, Nutrition and Indigenous Medicine has taken steps to provide new ambulances to 132 hospitals across the country. 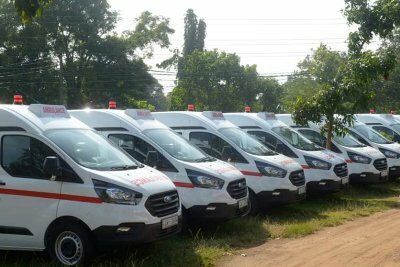 The distribution of these ambulances officially to the hospitals will be held under the patronage of Minister of Health, Nutrition and Indigenous Medicine Dr. Rajitha Senaratne on December 18 at 2 pm at the Colombo Municipal Council premises. The 132 Ambulances manufactured by the Ford Company in the UK have been imported by the Ministry of Health at a cost of Rs. 2.5 billion. The Minister has taken measures to distribute 250 ambulances to the hospitals in the country and 100 ambulances made by the Germany's Benz Company will soon be distributed to the hospitals. At present, 40 Benz ambulances have been distributed among hospitals while Ford ambulances will be given to 103 provincial hospitals, 27 government hospitals and 2 Ayurveda Department hospitals.